An Italian Biscotti Regina Recipe fit for a queen or even a princess. 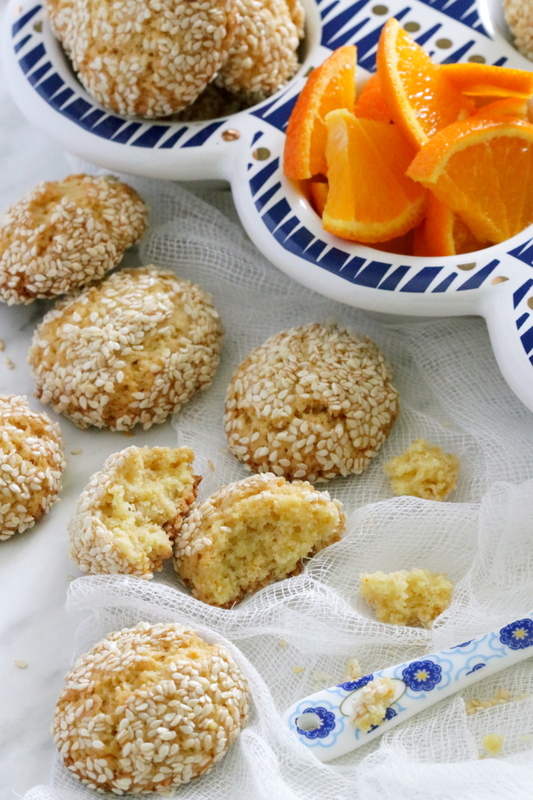 They’re an extremely popular Sicilian cookie with a distinctive sesame seed crust. Made with olive oil, perfumed with both orange blossom water and the zest of an orange. These cookies are not overly sweet and truly irresistible. Biscotti Regina easily translates to Queen’s cookies and is a classic Sicilian cookie. There is some speculation that these Biscotti Regina were named after Queen Margherita di Savoia. She was the much beloved queen of Italy and wife to King Umberto I. Another more popular and well known food named after Italy’s favorite queen is pizza Margherita favoring the colors of the Italian Flag. Red, white and green representing tomatoes, mozzarella and basil. Really though, you don’t have to be a queen to enjoy these yummy cookies! More on these irresistible cookies! These cookies came about after a dear reader inquired about them. Although they can be made with butter, shortening or olive oil, I settled on the latter after testing them with butter. I love the depth of flavor olive oil lends to these cookies and its truly a wonderful alternative to butter. Also I added orange zest and some orange blossom water for extra flavor but do go easy on blossom water. Otherwise, they will turn out tasting like a floral bouquet! They’re simple to make and if you have little ones who love to help in the kitchen then they’ll get a kick out of rolling the cookies in the sesame seeds. There are a couple of ways to shape these cookies. One is to keep them in a log shape after rolling and cutting the pieces. But if like me and you prefer a more oval or rounder shape then simply roll the cut pieces into balls. Then dip into the beaten egg whites and finally roll in the sesame seeds. Just before they’re ready for the oven I press them down a little then I cup the 2 sides together with the palm of my hands. This presses them back up a little while forming an oval shape. Alternately, you can dip them in milk and then roll in the sesame seeds if you wish. But I find that the sesame seeds adhere better to the egg whites and render crispier outer layers. It’s all a matter of preference I guess! They bake up into these pretty shapes with a lovely crackle top lending a little peek into its textured outer layers. They’re a crumbly cookie and slightly drier in texture with a tender bite. Perfectly dunkable in a steaming cup of coffee or tea! These cookies keep extremely well in an airtight container for at least a week if not a bit longer. I wasn’t able to test their freshness beyond that because they disappeared quickly at my house. But you’ll be happy to know that they also freeze well too. Perfect for make ahead desserts! Add some love in your kitchen with these yummy morsels and feel like a queen for the day! If you make this recipe remember to tag @marisasitaliankitchen on Instagram so I can see your creation! 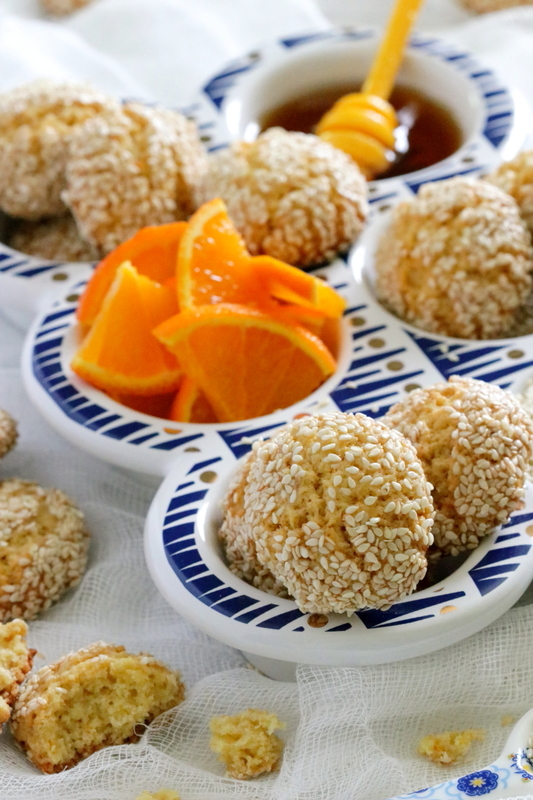 A very popular Sicilian cookie with a distinctive sesame seed crust. Made with olive oil, scented with both orange blossom water and orange zest. These cookies are truly irresistible. In a large mixing bowl stir together the flour, sugar, baking powder and salt. Add in the olive oil and mix with an electric mixer just until a fine sandy texture is achieved. Mix in the eggs, vanilla extract, orange blossom water, orange zest and honey until well incorporated. In a small bowl beat the egg whites with 2 tablespoons of water using a fork and set aside till ready to dip the cookies. Divide the dough into 8 equal portions and place on a lightly floured work surface. Working with one portion of dough at a time, on a lightly floured surface, roll into a log of 1 inch wide in diameter and 10 inches long. Cut the rolled dough into 5 equal pieces and roll each piece into a ball. It will be approximately the size of a walnut in its shell. Set aside and repeat with the remaining logs. 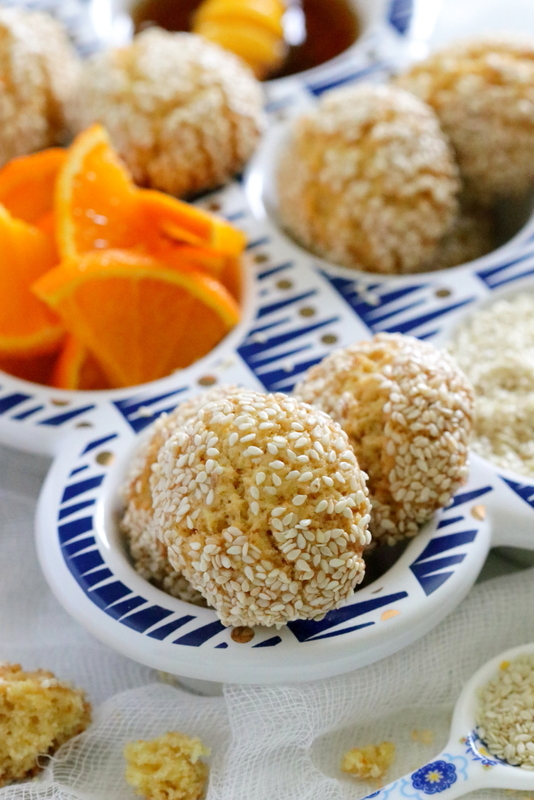 When all your balls are shaped, use a fork to dip one cookie at a time first into the beaten egg white mixture and then roll in the sesame seeds while turning to coat all over. Transfer each cookie to the prepared sheet pans. Press down slightly on each cookie and the tuck the edges back up using the palm of your hands to form oval shapes. I was able to fit 20 cookies on each baking pan. They don't spread much but will puff up. Bake for about 18 to 20 minutes or till golden brown. Allow to cool on a wire rack and enjoy with a cup of coffee or tea. These cookies keep extremely well in an air tight container for at least a week. I haven't tested them past that one week because they're simply too yummy to have lasted any longer. We did just that every morning with our coffee and then again with our evening tea…it was quite disappointing when they were all gone? cookies don’t stand a chance at my house…thanks so much! Diane they’re really quite yummy and if you love sesame seeds then you’ll appreciate their nutty flavour in every bite! You deserve to feel like a Queen for the day…go for it? I would feel like a Queen nibbling on these delicious cookies! Cookies do not last long in our house as well and these would be consumed so quickly. Lovely photos. Thanks so much…I see I’m in good company when it comes to cookies? these are fun to make and perfectly dunkable! Biscotti type cookies are so wonderful, aren’t they, Marisa? I love the look of your Italian Biscotti Regina biscotti cookies and I am quite fond of sesame seeds as well. I have eager little ones who would love helping with this recipe and I also like the idea that they freeze well. That is always a big bonus. Thanks for sharing! They look scrumptious! Denise I could very easily have a good biscotto or cookie over a slice of cake any time! These are easy to make and just a teeny bit messy when dipping…but what kid does not enjoy a little mess right! Thank you Denise? These look great. I don’t remember seeing them in Sicily, but the pastry shops have so many different treats there that it is hard to keep track. Stefan the more familiar shape of these cookies are log forms, I was aiming for more of an oval look but whichever way they’re sure to please! Thanks so much! I must try your recipe using olive oil, rather than butter next time. The addition of the orange blossom water is also something new for me, but I can tell that it works. These biscotti are truly representative of the Arab influences that exist on the island of Sicily. Thank you so much for sharing. Paula the olive oil is a nice alternative to butter and either one is wonderful! 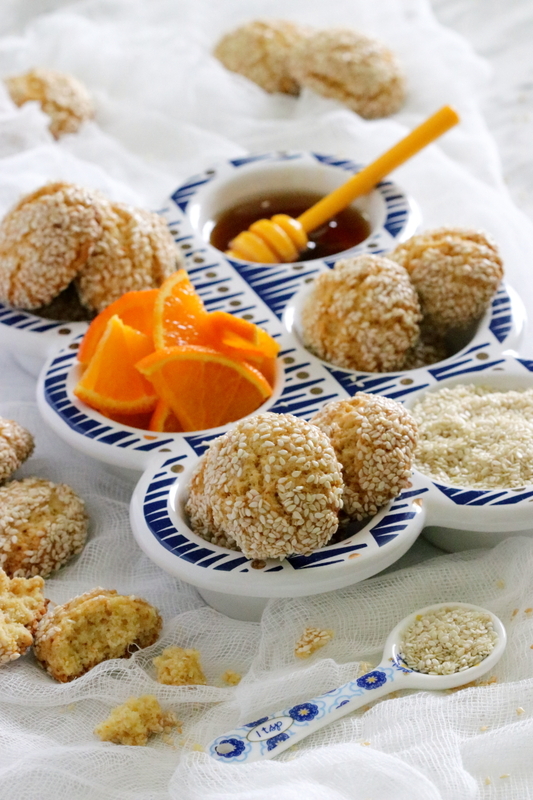 Sweets from Sicily are truly remarkable and your right there is a noted Arab influence! I’d love to visit one day….in the meantime we can simply taste test from home ?